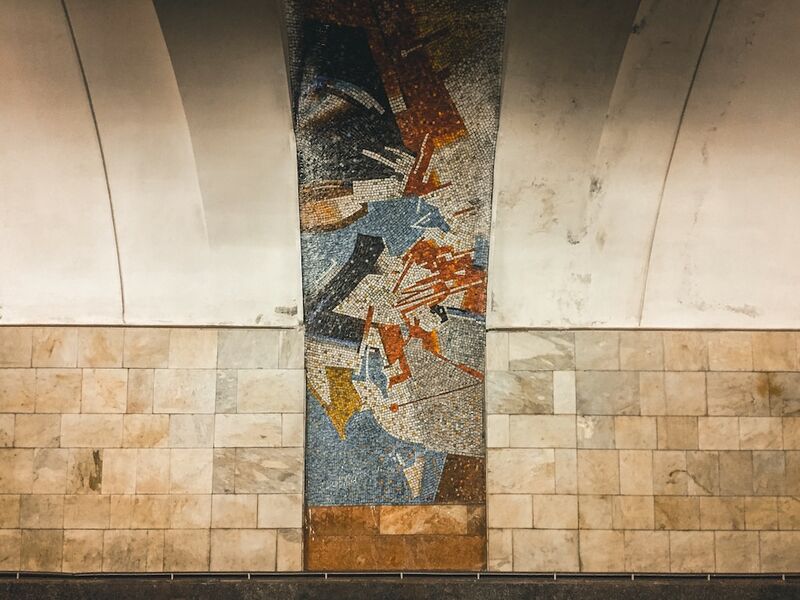 The Metro Systems of the Soviet Union were elaborate and a source of pride for the now exanimate nation. 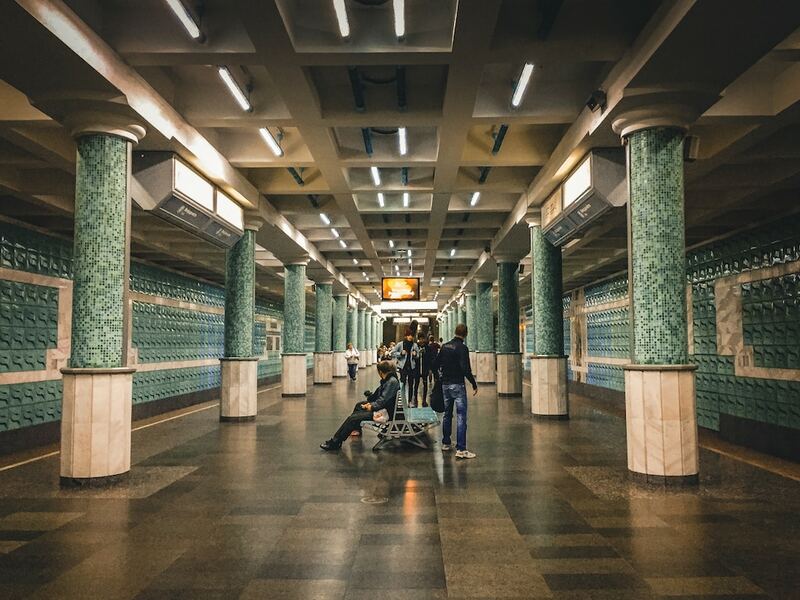 Coming from a nation whose public transportation networks are so undeniably terrible, I am always impressed with Soviet metro systems as they are fast, efficient, inexpensive, and have competently served numerous cities for decades. The Kharkiv Metro System is no exception. 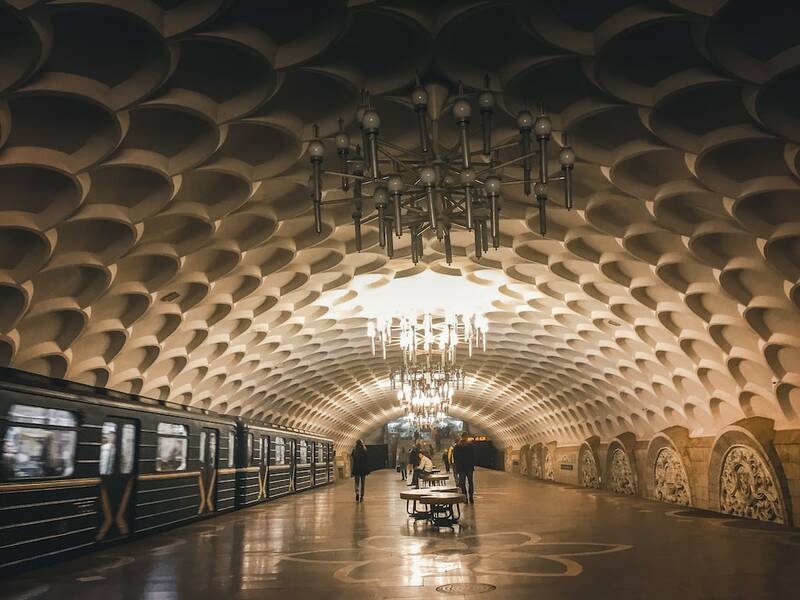 Built by the Soviet Union but expanded on later by Ukraine, this metro system is a decadent amalgamation of two nations, one of the past and one that is trying to find its future and feet in modern-day Europe. 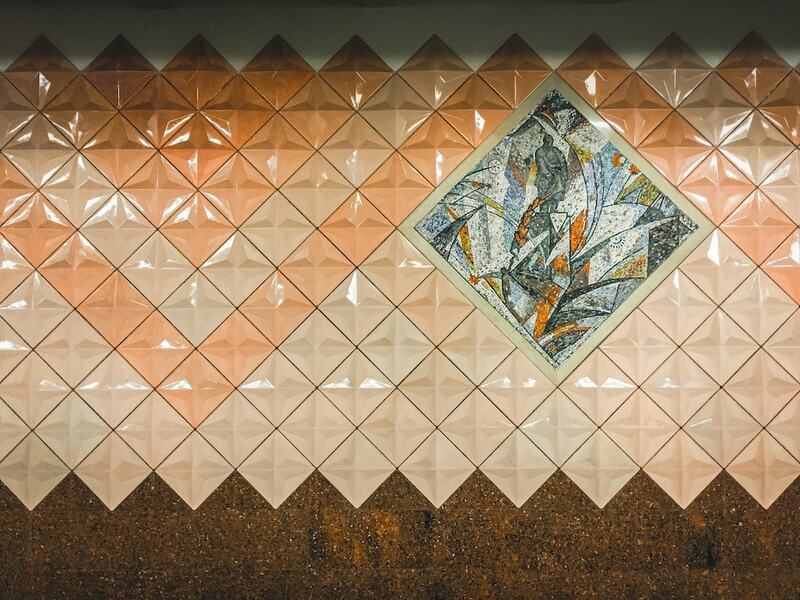 It’s no question that I have an affinity for the opulent metro systems of former-Soviet countries. I’ve mentioned it on this blog quite a few times. While some are better than others (thumbs up to the beautiful Moscow metro stations, Kyiv, Minsk… and basically all Russian metro systems), I almost always find their stately stylings enticing and I typically make it a point to ride the metro for a few hours when in a city that has one, exploring the stops and stations one by one. In Kharkiv, I set out early on a Sunday morning to ride the metro for a couple of hours continuously. Sunday mornings are sleepy in Kharkiv and nothing was finite proof of this more than the emptiness inside of Arkhitektora Beketova, my starting point for the day. I was equipped with a crappy iPhone6 for the journey as it was more inconspicuous than toting along my usual DSLR. Why be inconspicuous? 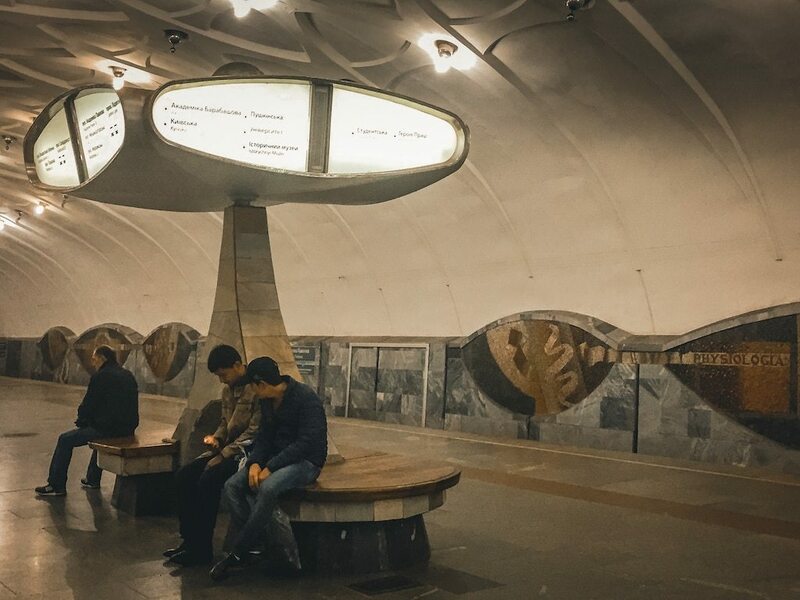 Well, post-Soviet metros have a tendency to have old women running around yelling at those taking photographs inside of them. While this archaic rule has been abolished in most places, the old women are creatures of habit and still don’t mind letting you know that you shouldn’t be taking photographs inside of the metro station- with flamboyant arm gestures and a loud voice that will make you feel like you’ve just murdered royalty or something. Since I am technically permitted (there are even signs stating this in certain systems), I like to exercise my rights, but sometimes I just can’t be bothered to fight back in broken Russian and I take my iPhone for the job. Click here to find a map of the Kharkiv Metro System. The year 1975 was a big year in history as it was the year that the United States and Soviet’s first joint flight, Apollo–Soyuz, took place (July 15) in an effort to create a little détente between the two superpowers. It was also the year that Microsoft was founded and that the Vietnam War ended. And in a city that was once the capital of Ukraine before WWII obliterated it from an infrastructural standpoint, a metro system was built. The Kharkiv Metro System is an interesting transportation system. The system was the second to be built in Ukraine after Kyiv’s and was sixth overall in the Soviet Union. It currently consists of three lines which run for nearly 24 miles (or 38 kilometers) and serve 30 stations. Its ridership is pretty significant with a daily and annual ridership at 663,150 and 231.1 million, respectively (figures are from 2013). The three lines that efficiently connect the city of Kharkiv are Kholodnohirsko-Zavodska, Saltivska, and Oleksiivska. In 1975, the Kholodnohirsko-Zavodska line, or red line, was opened for business. It is the largest line by length and also has the largest number of stations on it at thirteen. The Kholodnohirsko-Zavodska line serves as the city’s most practical thoroughfare and connects several important places within Kharkiv. It was initially named the Sverdlovsko-Zavodska line, but after the dissolution of the Soviet Union, the line was changed to Kholodnohirsko-Zavodska to make it more neutral. The red line was the first in the Soviet Union to use a unified central time system instead of the analog time system that had been previously in place. Unfortunately, I spent most of my time along the Saltivska and Oleksiivska Lines, neglecting the oldest line of the Kharkiv Metro. I did make it to one station, mostly because it was on my way to the Kharkiv Railway Station, where I was going to board a train from Kharkiv to Kyiv. 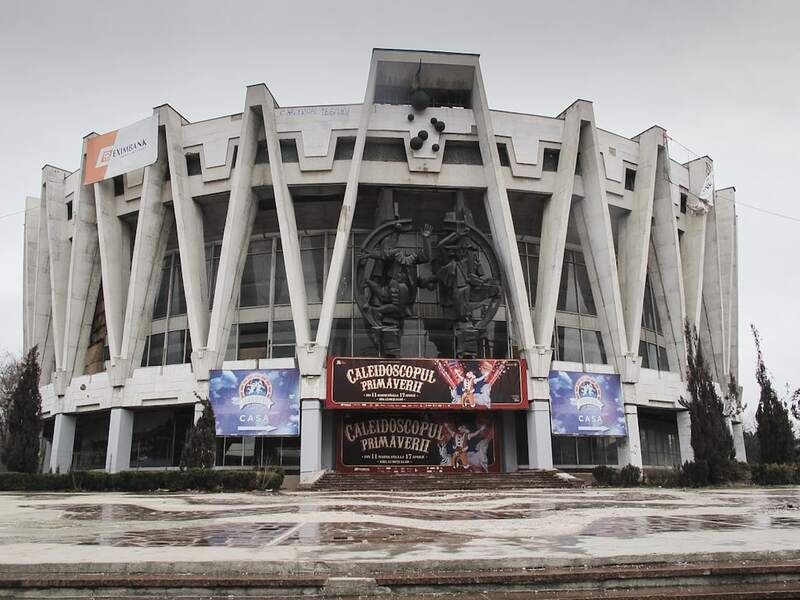 As the name suggests, the Sportyvna station is located in close proximity to the FC Metalist Kharkiv Stadium (a football stadium and the largest one in Kharkiv). 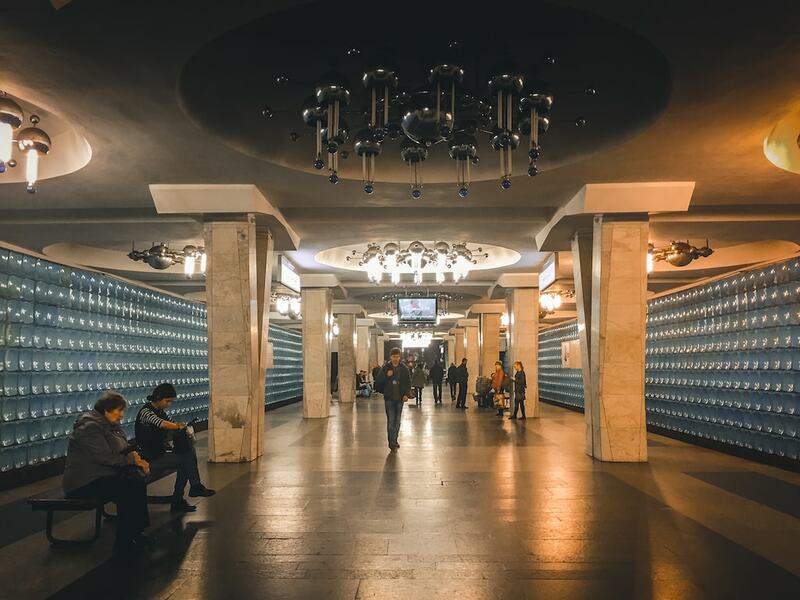 Located in the southwestern part of the city center at Plechanivska Vulytsia and the Derzhavinska Vulytsia junction, the station was opened to the public on August 23, 1975. The brainchild of Y.A. Plaksiev and V.A. 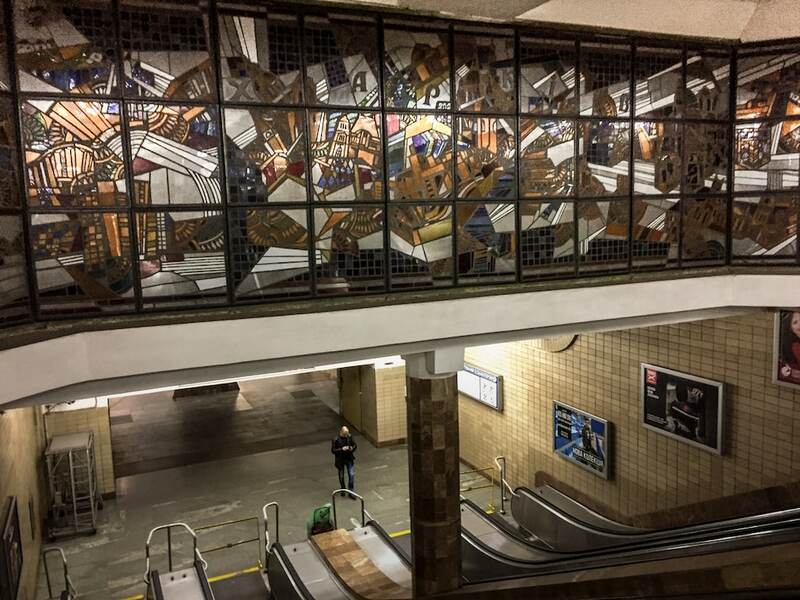 Spivachuk, many argue that this station was one most successful works of art in a USSR subway. 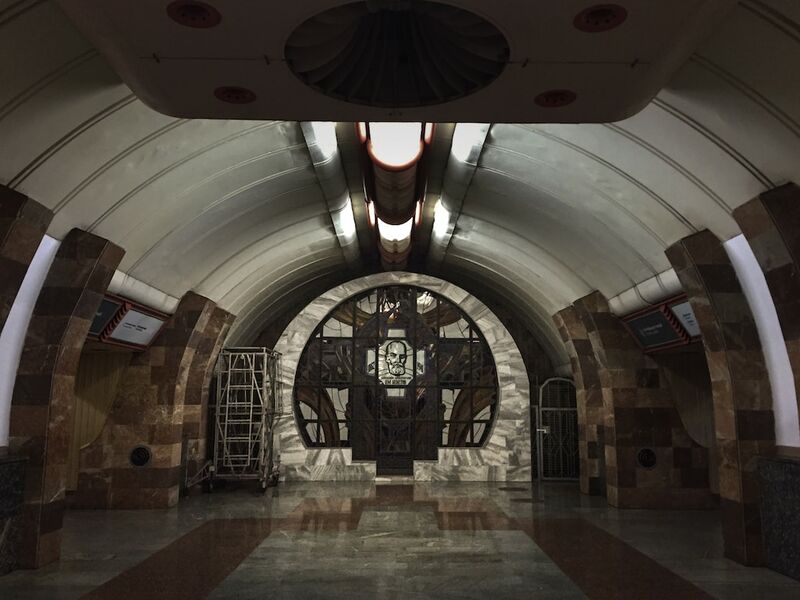 But, locals didn’t want this metro to be known for its Soviet history, but rather its Ukrainian future. The colors of the Ukrainian flag were painted diagonally across the vaulted roof in 2009. 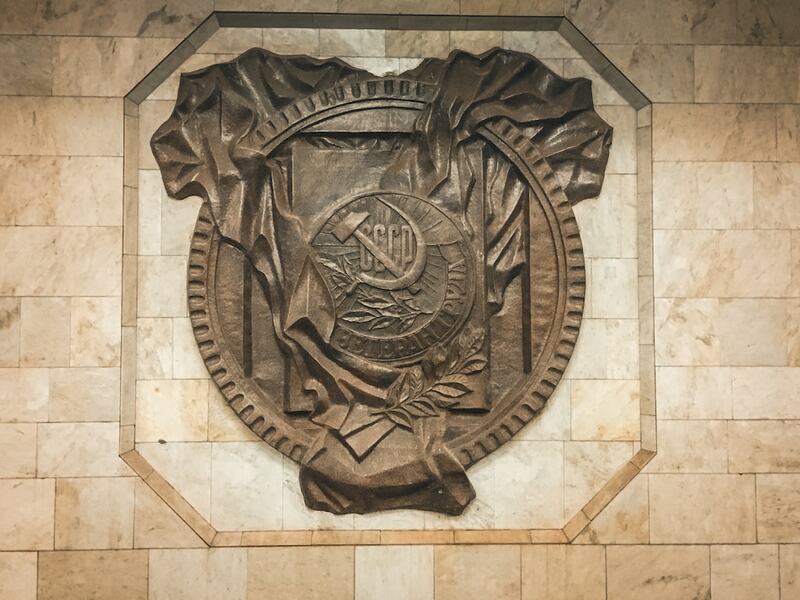 Unnecessary Kharkiv Metro Photo Police Interventions: 0 – signs of patriotism deserve to be displayed to the world and that is exactly what I intended on doing… to the 5 people that are searching about the Kharkiv Metro monthly. 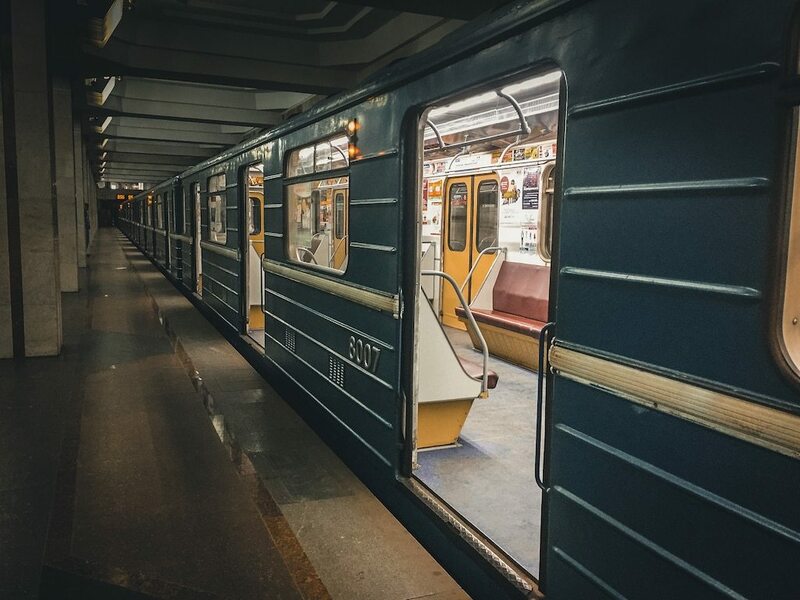 The Saltivksa Line was the second line built on the Kharkiv metro system and it was opened on August 10, 1984, shortly after my first birthday (had to throw that in there). The Saltivska line is the shortest by length and services eight stations. There is currently talk and speculation that would expand this line to an extra six stations, but nothing has been officially signed off and action would not take place until at least 2020 if approved. Interestingly, the Saltivska line is the first line to use the current wagon models that are ubiquitous across the former-Soviet republics and Eastern Europe today. The Heroiv Pratsi metro station was opened October 24, 1986. The name, translated into English from Ukrainian (it was previously changed to Ukrainian from Russian) means ‘Heroes of Labor’. The atmosphere inside of the station is stiff. 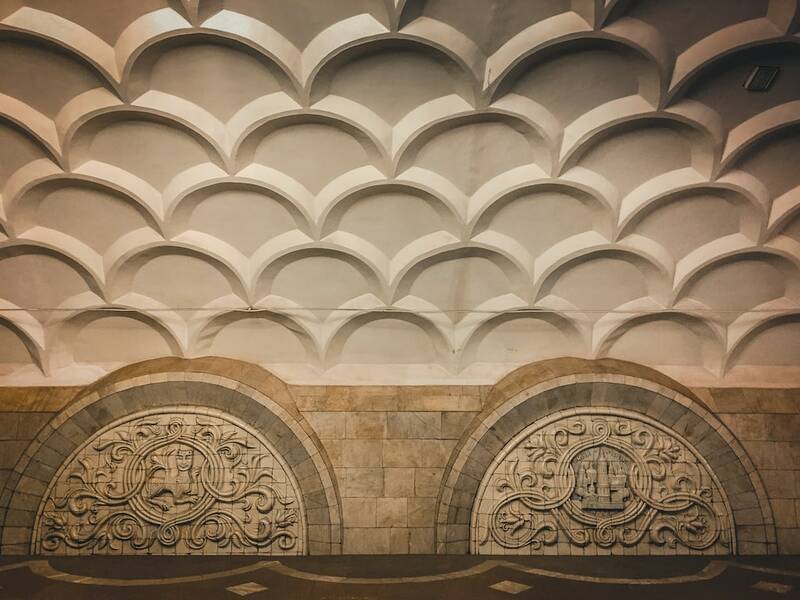 I’m not sure if it was the sickle and hammer plastered on the art pieces on the walls of the metro station, but something made the metro photo police feel compelled to shout and careen over my way to tell me to stop taking photos. Fortunately, a wagon arrived (this stop is the end of the line) and I smiled and stepped on and headed to the next stop. The station was a bit too rigid for my taste, anyway. Unnecessary Kharkiv Metro Photo Police Interventions: 1 – but I escaped pretty quickly and completely unscathed (my feelings were a bit hurt though). Whew. 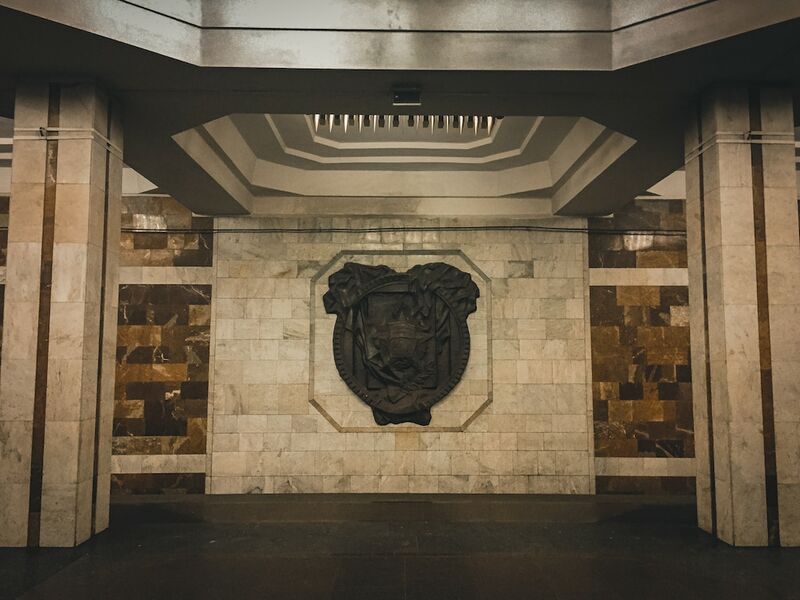 The University metro station was opened on August 10, 1984 and originally went by the name ‘Dzerzhinskaya’. In 1991, as a result of the dissolution of the Soviet Union, the name was changed to University. Personally, I think the name ‘Lackluster’ would have been better suited. While it is a busy station, it lacked character and I just remember ads littering the place. Can’t win them all, I suppose. The metro station connects with the Derzhprom station on the Oleksiivksa line. This metro station opened on October 24, 1986. 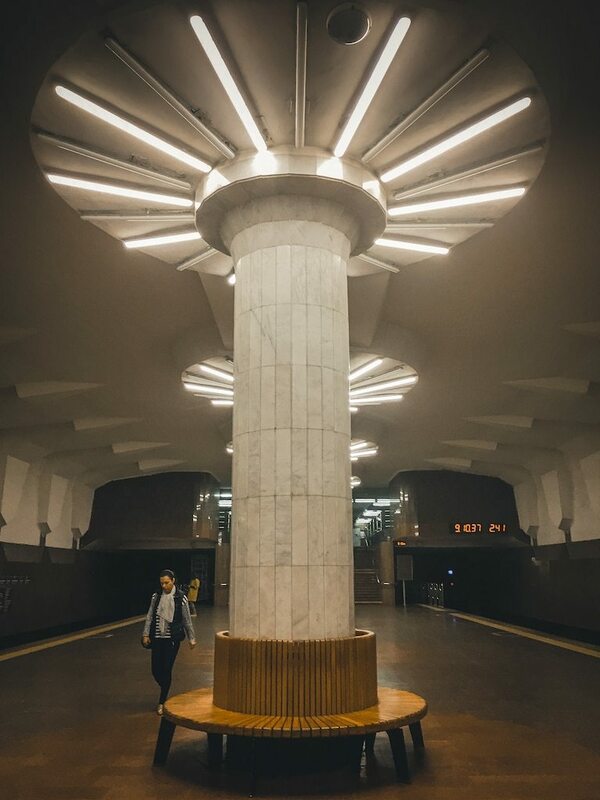 Akademika Pavlova was one of my favorite metro stations I checked out because it looked exactly like something I would have envisioned the Soviets creating. Mosaics? Check. Seats and decorations that look like robots? Check. The station was named for I.P. Pavlova, who was a scientific genius in various fields of knowledge such as physiology, biochemistry, and psychology. In the northern lobby, you can even see a bust of Pavlova. The station is not deep and only served by stairs- no escalators. Akademika Pavlova was the mastermind of architects V.A. Spivachuk, A.Z. Denisenko, and P.G. Chechelnitsky. 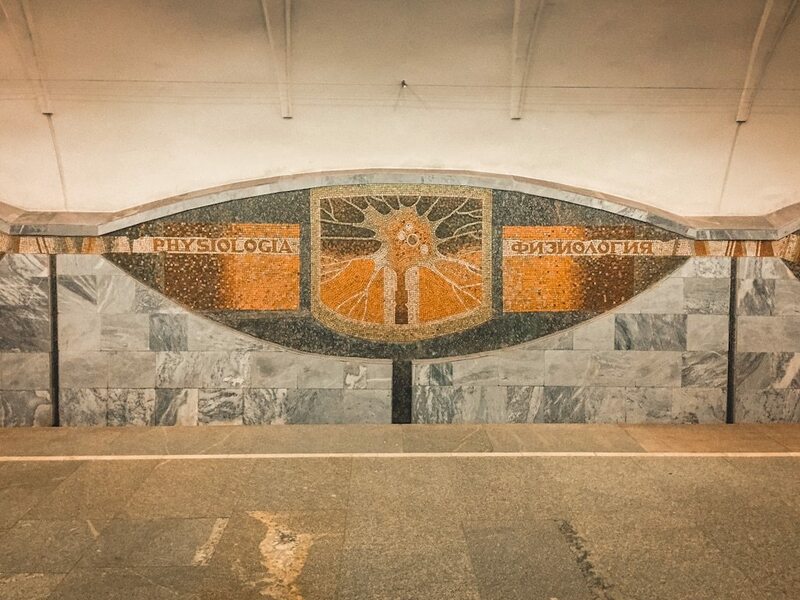 This metro station, situated on the Saltivska line, is a homage to Soviet-Ukrainian astronomer Nikolai P. Barabashov. He was a recipient of an Order of Lenin and later became a member of the Ukrainian SSR Academy of Sciences in 1948. The Akademika Barabashova station opened on August 11, 1984, and was initially called Barabashova. 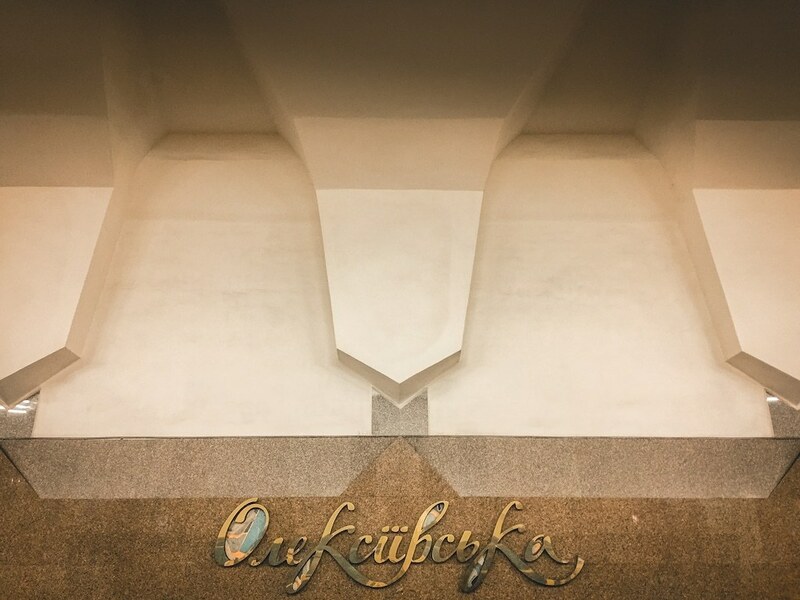 Ukrainians later started to confuse the metro station and the shopping center of the same name, so officials decided to rename the station Akademika Barabashova in order to still honor how great his impacts were for Soviet space odysseys. 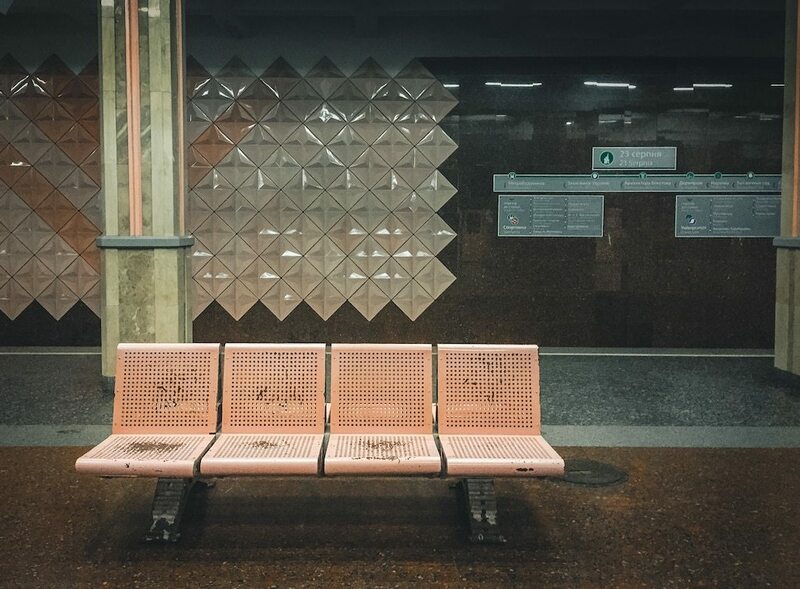 In 1986, when three stations opened on the Kharkiv metro, service to this station drastically declined. Fortunately, in 1995, a wholesale clothing market opened close by and revived some of the traffic. The wholesale clothing market eventually became the largest market in eastern Ukraine. 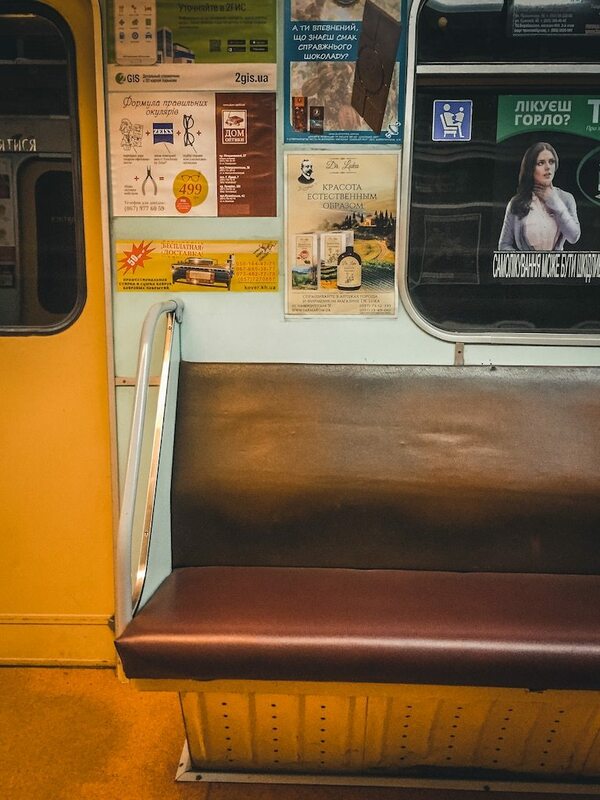 Unnecessary Kharkiv Metro Photo Police Interventions: .5 – was a close call here, but I escaped before she got to me. On second thought, maybe she was just running over frantically to me to tell me that she liked my shoes? 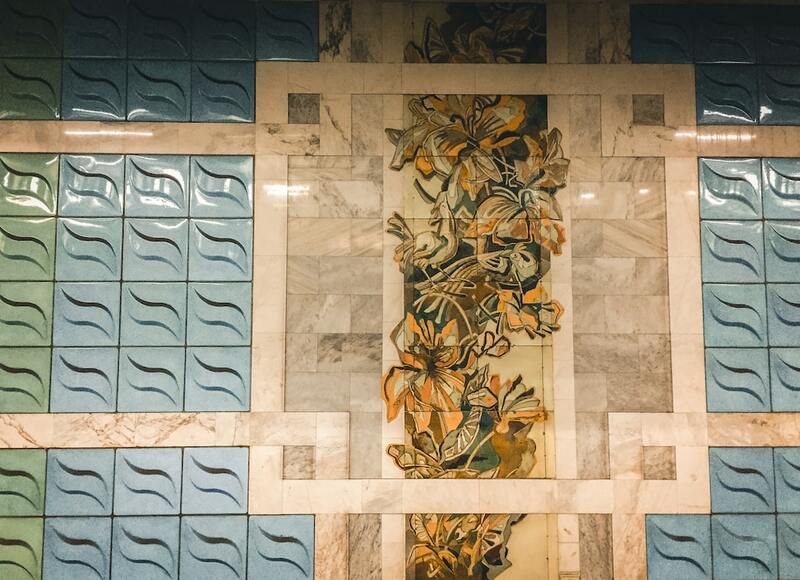 In my opinion, this station was easily the most beautiful station on the Kharkiv metro system. Decadent and ornate, it somewhat reminded me of the metro in Washington, D.C. I was quickly reminded that it was not that metro when the train actually showed up. The Kyivska metro station was opened August 11, 1984. It is located at Shevchenko and Matyushenko streets which are one of the busiest urban transport interchanges in all of Kharkiv. There are no escalators at this station. The architects who designed the station were V.A. Spivachuk, P.G. Chechelnitsky, E.A. Perepelitsa, and I.T. Karpenko. I think they did a hell of a job from an ‘I like to take photos of pretty metro stations’ standpoint. This station was often used on brochures or in public media, so pictures were often taken here. Perhaps that is why I was never glared at or chased down. 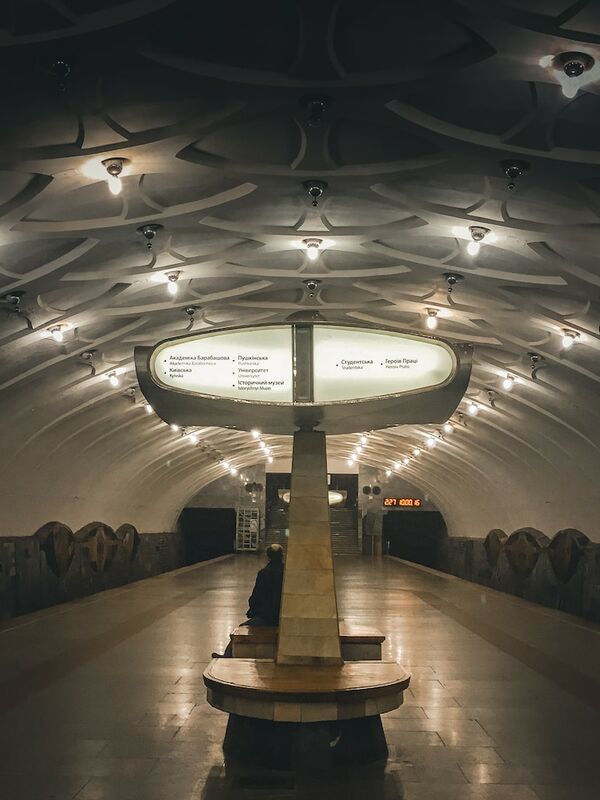 The Oleksiivska Line is the newest line on the Kharkiv metro system as it was opened on May 6, 1995. 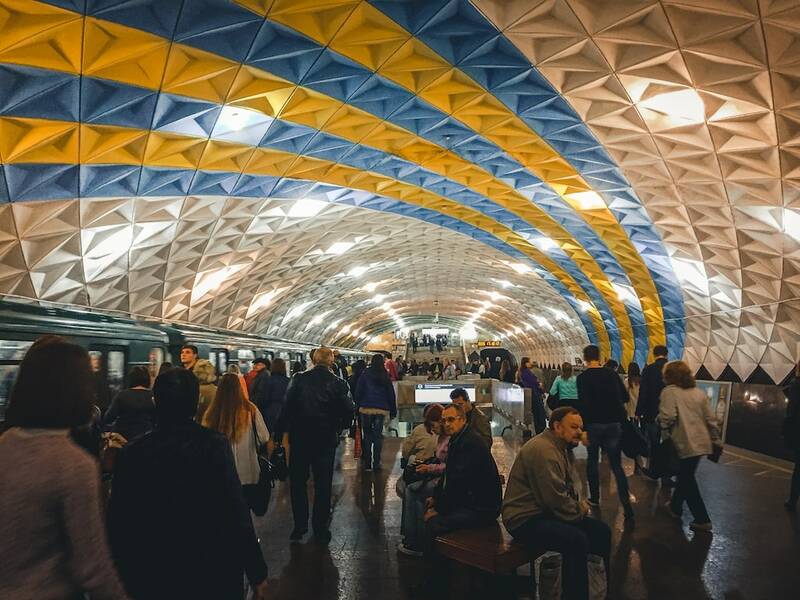 It is the second longest line on the Kharkiv metro and has a total of nine stations that it services. 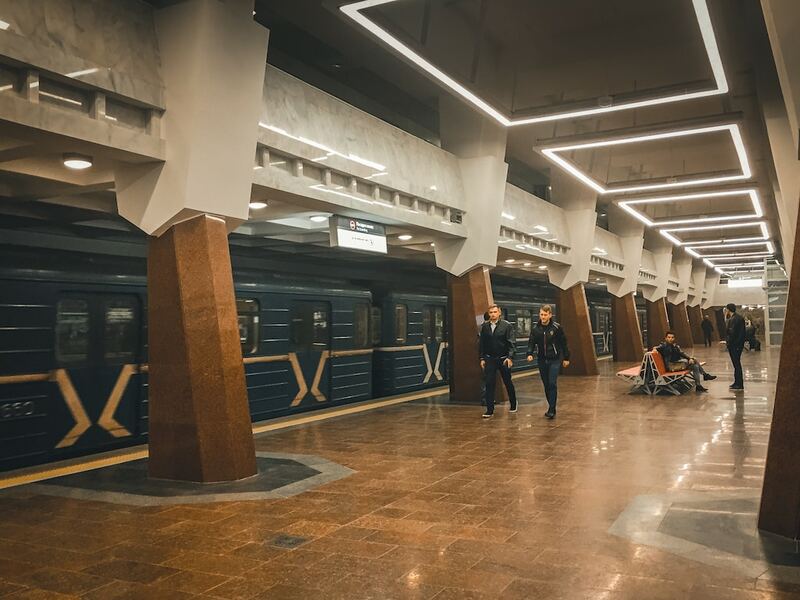 The last station to be opened on the metro in Kharkiv is Peremoha, and that is serviced by the Oleksiivksa line, or the green line. There has been extensive talk about expanding this line to the airport and stations Derzhavinska, Odeska, Motel Druzhba, and Aeroport were proposed. However, only Derzhavinska and Odeska have had actual construction take place and there is no definitive information on whether or not Motel Druzhba and Aeroport will actually ever start construction. Derzhavinska and Odeska are slotted to open for service in 2019. This is where my journey actually began while cruising through many of the metro stations along the Kharkiv metro system. Not built by the Soviet government, but rather by the Ukrainians, this line is pretty deep as a result of the elevated landscape that surrounds it. The station was named for A.N. 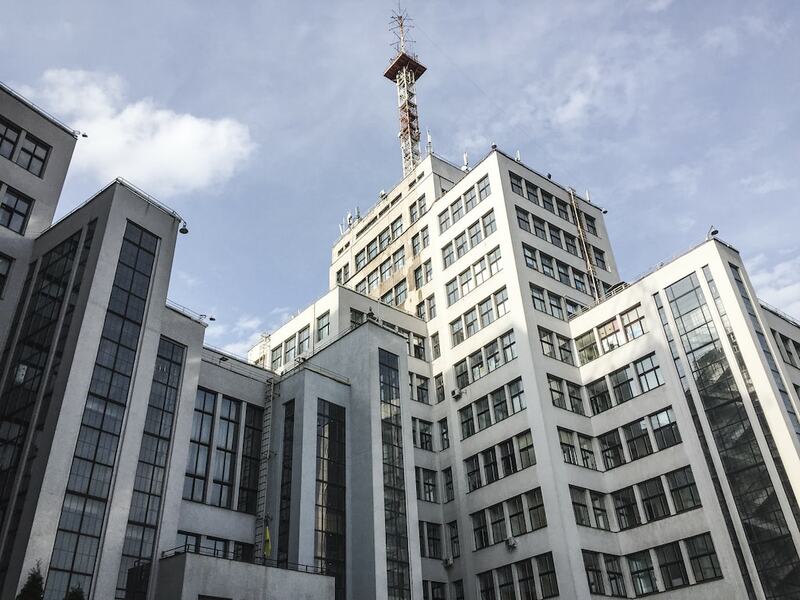 Beketov, an architect whose work has a significant presence in Kharkiv, and particularly the area surrounding Arkhitektora Beketova as he built many mansions there. You can see stained glass honoring him on the platform there. The station opened May 6, 1995, and was the work of architects V.A. Spivachuk and I.T. Karpenko. The station, from the mid-1990s, feels like something out of a sepia-infused, politically-incorrect 1970s sitcom that I would have watched on reruns on Nick at Night as a kid. COLOR! Finally! We have moved on from the 1970s and into an era where the Golden Girls and Miami Vice collide with the phenomenon that is public transportation. Interestingly enough, 23 Serpnia metro station was opened in August 2004… so I believe we are running about 15-20 years behind with aesthetics in this station. The station was named to honor the date of the city’s liberation from fascist invaders (23 Serpnia means 23 August). The bright colors continue at Botanichnyi Sad, where the vibe is cooler and slightly more airy with its blue and green hues. Before you forget where you are and think you’ve landed in the Seychelles, you ‘may’ be approached by a lady monitoring the (not illegal) photography situation in the metro station. She may approach you and tell you to stop taking photos on your phone in a very ostentatious manner. 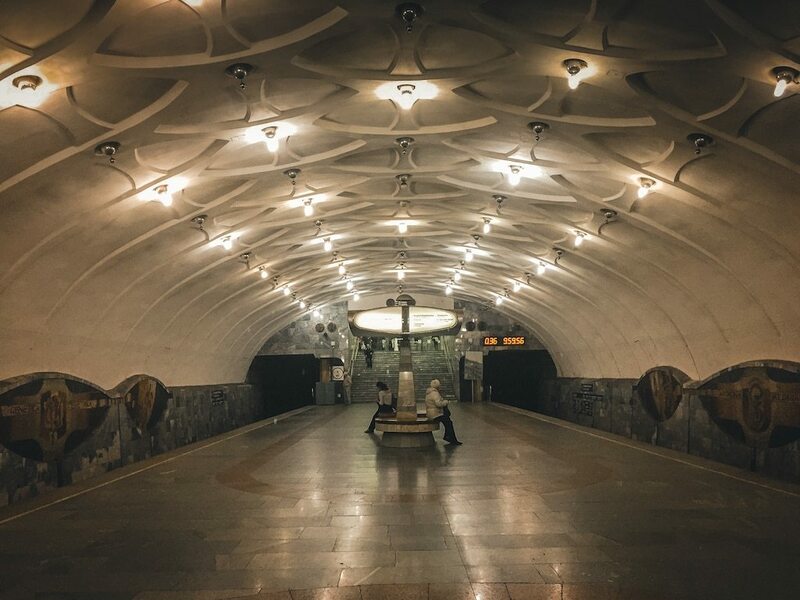 This is where you take a deep breath and inform her that you are doing a very, very important academically associated article on the Kharkiv metro system and were given permission to take photos by the signs that say it is permitted to do so. 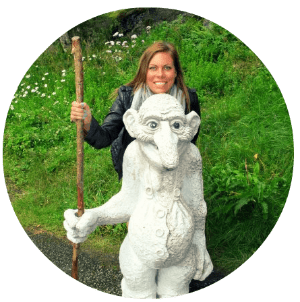 And by very, very important academically associated article… I mean this blog (where I sometimes talk about beer and other important stuff). 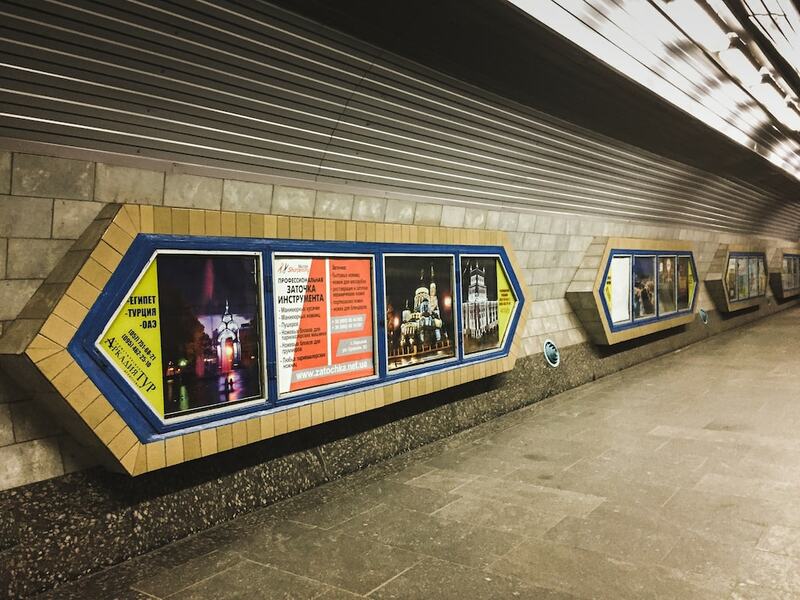 Unnecessary Kharkiv Metro Photo Police Interventions: .5 -not counting this as a full situation as she so graciously granted me permission after realizing how important it is to get the photos of the Kharkiv metro out to the five people searching for them monthly. The Oleksiivska station opened rather recently on December 21, 2010. Not the most remarkable looking of stations, but it was the final stop on this line prior to the completion and opening of Peremoha station. This project was actualized in 1992 but took quite a while to complete and open the station for business. Unfortunately, most projects realized in 1992 struggled to come to fruition as a result of lack of funding in a post-Soviet world. And finally- we have entered modern times with design. 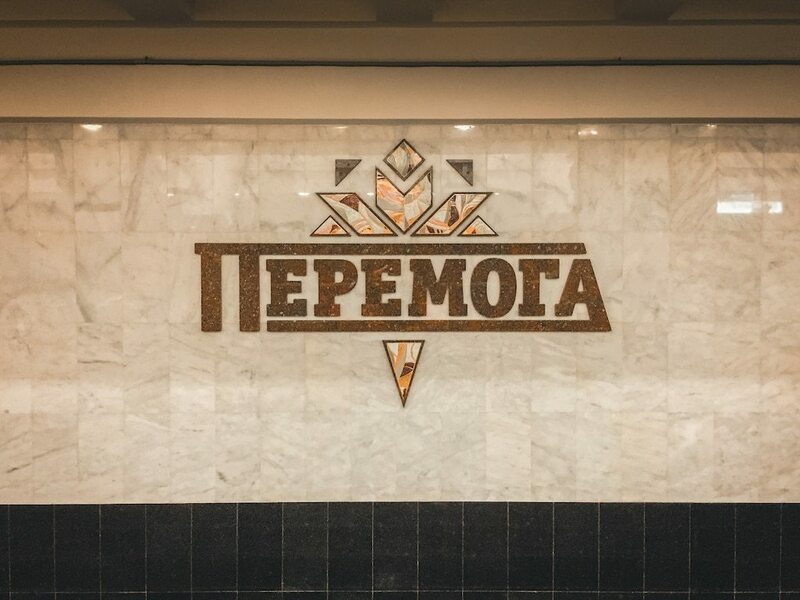 The youngest station on the Kharkiv metro, Peremoha technically means ‘Victory’. And a victory it is… if you’ve read this far about a metro system in Ukraine. 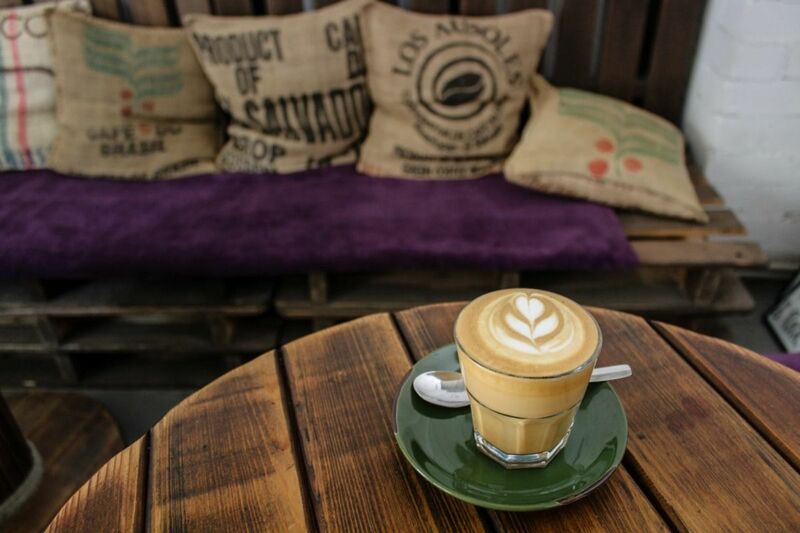 The Peremoha station is at the end of the line and its design is simple, yet elegant. It kind of reminded me of the metro stations in Almaty, albeit a little less embellished. The station opened to its first passengers in August 2016- which I was completely unaware of at the time as I was there only a month later. Funding problems have plagued this station, where construction first began in 1992 and stopped and began numerous times until its final completion in 2016. It also missed the cut to open for UEFA in 2012. Peremoha station was initially supposed to be modeled in the typical Victory Day theme, which is celebrated every May 9 in many post-Soviet countries. However, in 2015, when the decommunization laws (outlawing Soviet and Communist symbols) went into effect in Ukraine, the country decided against decorating it as a representation and commemoration of Victory Day. Strangely enough, they decided on an interior that represented Victory Day over Nazism in WWII, which is also celebrated on May 9. So yea… On another note, this is the first station to be handicap accessible on the Kharkiv metro. The metro station at Derzhprom is a junction where the Saltivska and Oleksiivska lines meet each other, although it is technically on the Oleksiivska line. And, as the name suggests, the station services the famous Soviet behemoth of a building, Derzhprom, which was also Europe’s first skyscraper. Located beneath one of the largest squares in Europe, Liberty Square, the station opened in 1995 under the work of renowned architects V.A. Spivachuk and I.T. Karpenko. The station was built in the same pylons that Arkhitektora Beketova was built with proudly displaying the neverending polygonal walkways that we envisioned to be ever-present up on Mir. The Kharkiv metro system consists of 30 stops. Some are photo-worthy, some are not. I didn’t hit them all up and I did bypass certain stations that looked a bit drab in exchange for more time spent at Kyivska and company. 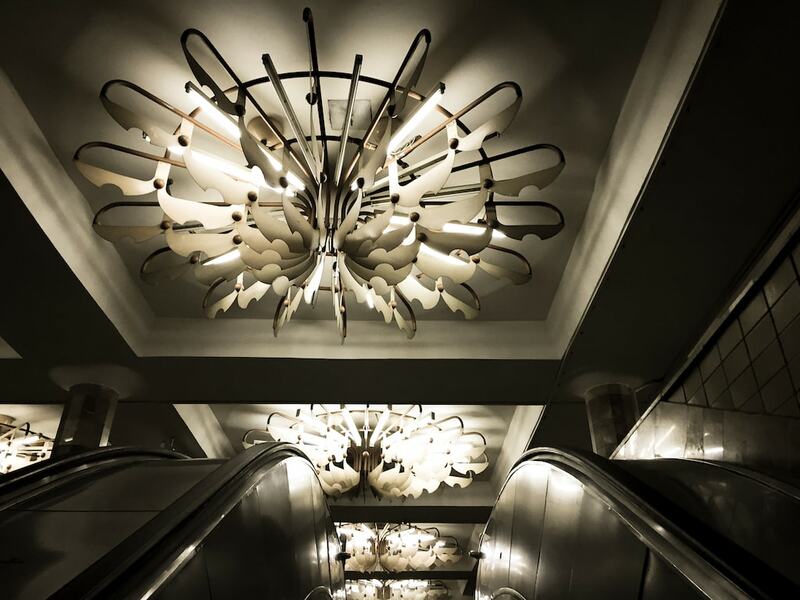 While this metro system isn’t going to blow minds, it definitely is a work of art. I also find it extremely interesting seeing the Soviet masterpieces in comparison to the Ukrainian ones, hence why I tried to spend most of my time along lines where I could see these comparisons in a more scrutinizing way. 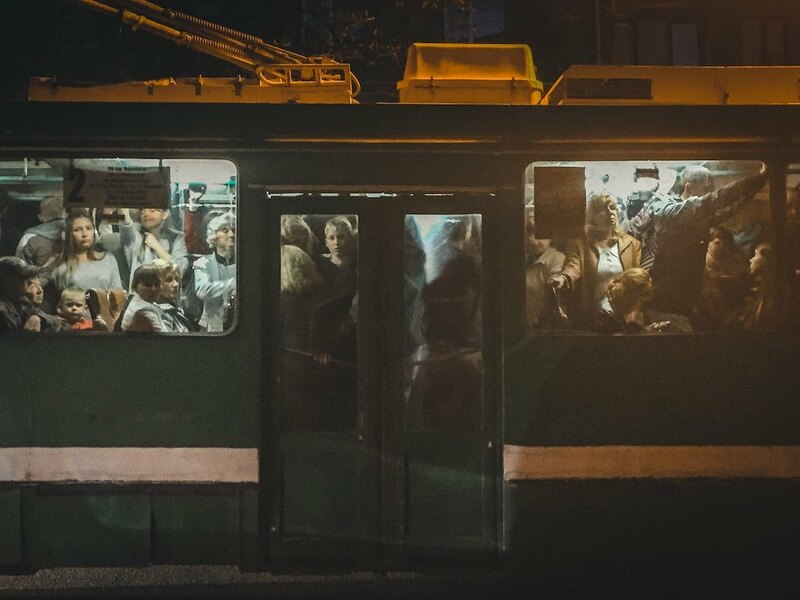 I hope you enjoyed this post and if you end up in Kharkiv, just say no to trams! 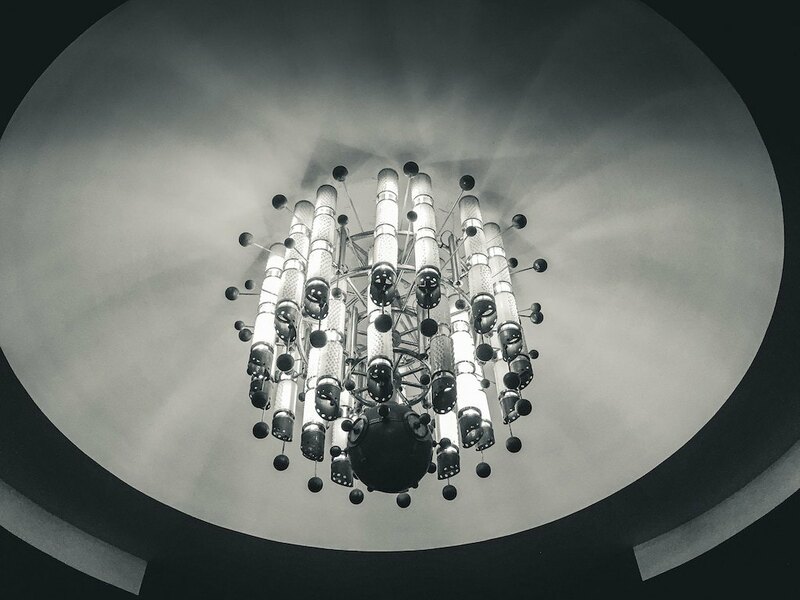 Take the metro- it’s less crowded and you never know what kind of architectural gems you may stumble upon. 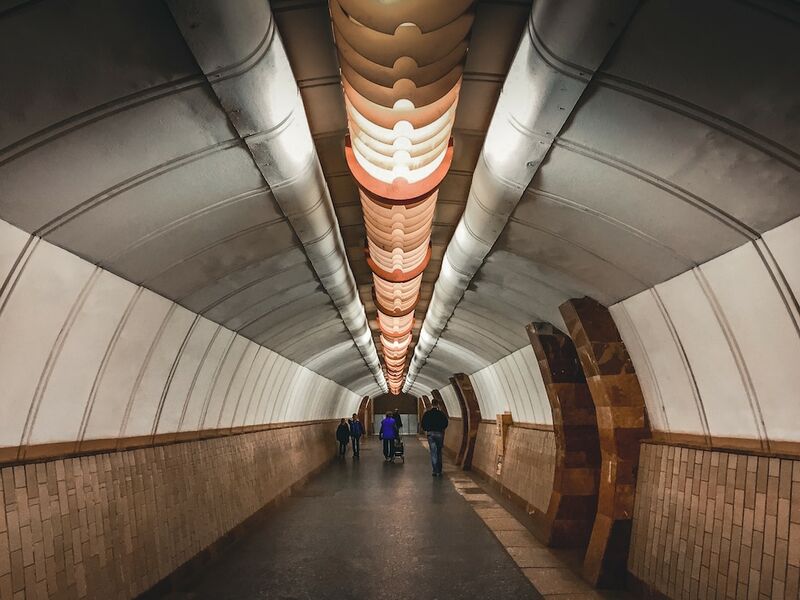 Have you ever been to Kharkiv or stepped foot on a Ukrainian (or post-Soviet) metro? What did you think? *Kharkiv or Kharkov? Kharkiv is Ukrainian and Kharkov is Russian. I always spell how people are searching, and surprisingly, they were searching the Ukrainian spelling on this one (unlike in Kyiv). So, there ya go. Not approving comments to this since it is out in the open. 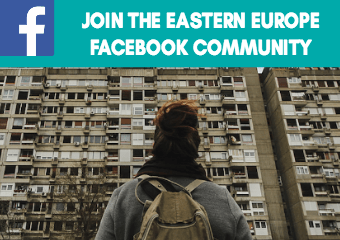 Are you interested in travel to the Balkans, Eastern Europe, and Former-USSR countries? If so, become a member of a group I admin. Click the photo to join! 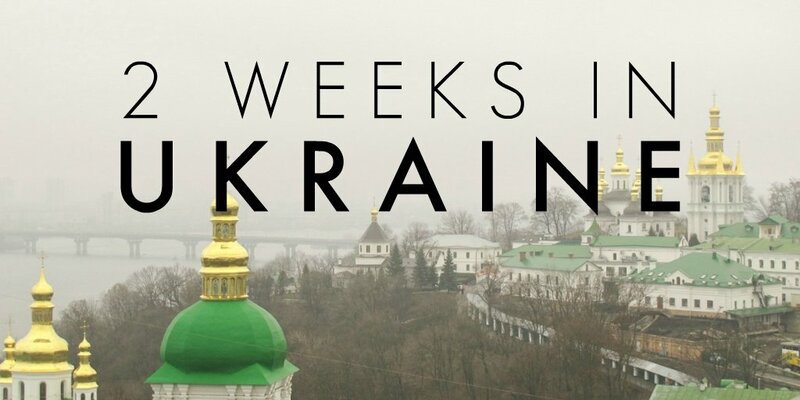 Ukraine Looks a great place for having a worth trip. You have shared really very nice post on it and you encouraged me to visit this place. Beautiful photos! Right now Ukraine is at the top of my “places I’ll probably go this summer” list and I’m pleased to see its public transit is on par (at least aesthetically) with that of Moscow! Wow, I am in awe, Megan!!!! :D Job well done! You taught me so many things I never knew about Kharkov’s metro, thank you.